Social Welfare Department, Government of Karnataka Provides Hostel Facility to the students belonging to Schedule Caste. ** Students who are currently studying above SSLC / 10th class. ** Students residing in Karnataka. ** Whose Family Income is below 2.5 Lakhs for Postmatric. Follow the steps mentioned below to register online to avail Hostel Facility. Step-2 : Then go to the ‘Registration’ link. Step-3 : Click on the ‘Register’ link under ‘Postmatric’ heading. Step-4 : Then enter your Aadhaar Number and Name as per printed in your Aadhaar card. Select your Gender and then solve the simple addition problem provided in the register page just for verification. 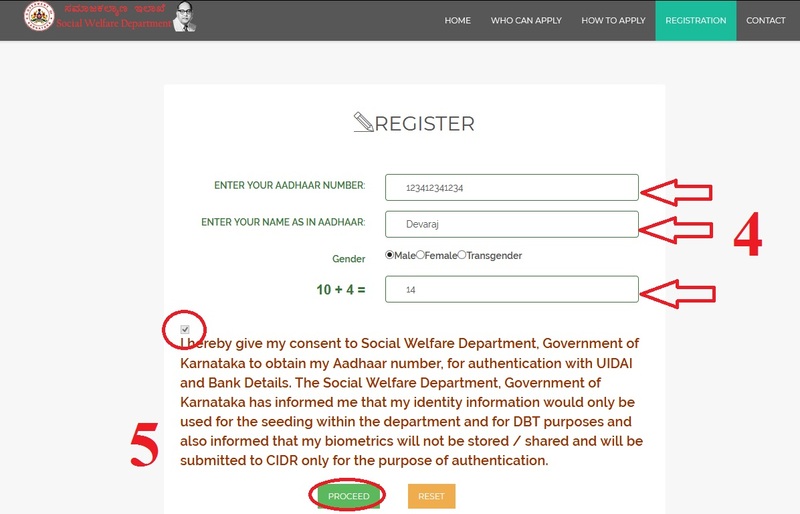 Step-5: After that, read the declaration and check the box and then submit the ‘Proceed’ button and do the further process to complete the registration. To reprint your acknowledgement, just follow the simple steps below. Step-2 : Then Select the Current Financial Year and enter your Aadhaar Number and Date of Birth. Step-3 : Click on the ‘Re-Print’ button to print your acknowledgement. I need admission in the Post Matric Hostel but registration is not taken. What to do now? Please assist me to check my name in hostel admission list. Please assist me, how to get forgotten registration number for post matric hostel admission. I have forgotten the application ID of ST Hostel. Can I able to get it again? I want to check my scholarship status by register number. I want to fill the form immediately, But the link is not opening properly. Please assist me, how to get forgotten registration number for post metric hostel admission.